This is about evaluating defective guns without going off the edge. As you might imagine, I get a lot of contact about guns. I get positive reports, negative reports, neutral reports, and questions. Reports are fine. Questions are fine. Here's what's not fine. And hopefully what follows will help people not make fools of themselves when they get a bad gun. First a couple of definitions. For the purpose of this discussion, a report is an account of first hand experience with a gun. A question is an inquiry into something about a gun. Both are reasonable and expected. This is what's sad. 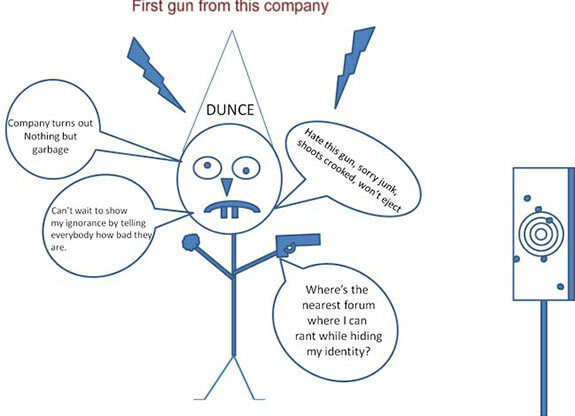 The guy (or it could be a gal) above who buys a gun for the first time from a company. The gun is defective. From that gun, this person first reports angrily. This person has to go to war against the company and every other product they make without any other experience with them. However, they don't have their own web site. They do this on other people's. Forums become a place this person really likes because they can see their rant in print under a fake "user name". They can put themselves forth as an angry expert. Other "experts" will join this person. Kind of like in a room full of kids, two bad ones can find each other. Nothing like observing a forum with lots of people calling guns they've never touched, "trash" from creatively limited minds. This is not about the disservice to the gun or a company. This is about salvaging people's reputation before they go do something so stupid, real gun owners disregard anything they say. If a new gun or a used gun in "excellent condition" falls apart in your hand, there's probably something wrong with it. If it won't feed, extract, eject, fire ..... whatever, there's something wrong with it. And if it does it with multiple magazines, there's something wrong with it. If it shoots two out of three types of factory ammo, something is wrong with it. It should shoot all three. Cheap ammo is not the problem. "Limp wristing" is a near myth and is not the problem. Something is wrong with the gun. Don't be this person above. 1. Good companies that turn out thousands of fine firearms turn out a dog from time to time. 2. 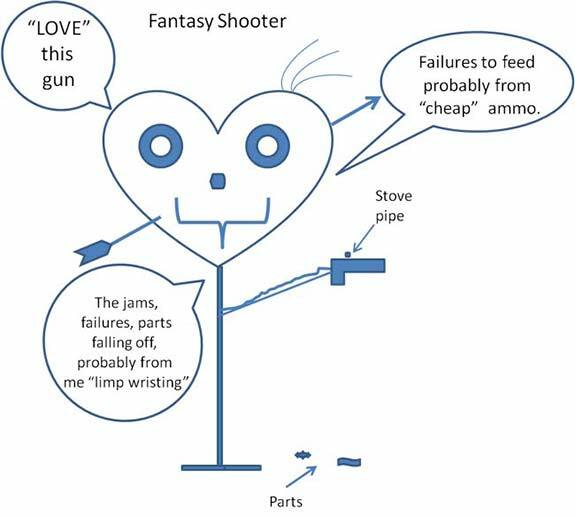 An individual gun that is defective does not make all other guns the company makes "junk". 4. Every company puts out defective batches of guns. And every company puts out guns with early manufacture "bugs". 5. Every firearms company gets a mixture of great to terrible customer service reports. Keeping those five realities in mind when testing, using and reporting on a gun will give credibility to the reporter. Unless the reader of a negative report thinks their gun is their spouse ..... in which case they may be ..... "offended".